To tell you a little about me, this will be my tenth year as a teacher. I taught at Liberty Elementary prior to becoming a Harmony Husky in 2012. 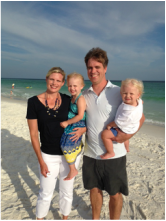 My family includes my husband, Jeff, our five year old daughter, Josie, and our three year old son, Tripp. We moved from Louisville to Goshen last summer. Before becoming a teacher I lived in New York City and worked in the fashion industry. In my spare time I love to be with my family, read, shop, and visit the beach. I strive to get to know each child individually so that I can best meet their specific learning needs and determine what learning styles work best for them. It is my goal to create an enriched and differentiated environment for every student while they are a part of my classroom so I can help each child achieve their personal best.